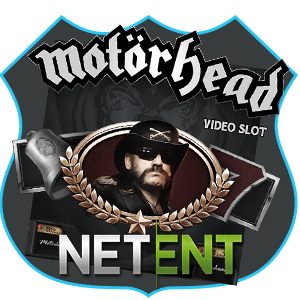 Motorhead Slot - NetEnt delivers a "Rocking" slot with a nice theme! If you’re a fan of rock music, then you must have heard about the legendary rock band that goes by the name of Motorhead. They have made some of the best rock hits in the history of the last century – no matter who you are you must have heard the song called “Ace of Spades”. We’re telling you all of this because this popularity of the band Motorhead is what made the game designers at NetEnt to make a slot game based on this rock band. And the game itself is called Motorhead. You can find more information about it below. As the saying goes – if you have played a single slot game, then you have played them all. This is because of the fact that they are all similar to one another – they are made to be really simple games that anyone can play, even a little child. Such is the case with Motorhead as well, and in order to play it all you will need to do is to press the spin symbol. Then you will hope for the best – and that’s it. There’s no strategy, no thinking on your behalf whatsoever, expect as to the level of bet you’re willing to place on a single spin. Which brings us to the next point – the game features incredible 76 pay lines. As a reference – most other games feature no more than 20 pay lines, heck most games feature 5 in total. And the pay lines at Motorhead are fixed – so you won’t be able to change the number of pay lines that you will play on while playing this game. The graphics and music at this game are set to the tune of Motorhead. The intro will show you the legendary band rocking a concert and playing their best-known hit – “Ace of Spades”. You can also listen to Motorhead music within the game – it’s a nice little addition for the true Motorhead fans. The scene is set at a rock concert – in the background you will be able to see the stage with the microphone and instruments. There are a few speakers in the foreground. Things may get lid up while you’re playing, so if you have a sensitivity of flashy images of any kind – it’s advisable not to play this game. There are different types of symbols within this game – you will have the clover, the horseshoe, the 7, the star, and some other symbols as well – all with their appropriate values. There’s also the wild symbol coming in the form of the ace of spades – and it can take the function of any other symbol. There’s also the scatter symbol – hitting three of them on any reel in any single spin will bring you a reward of 10 free spins. Finally, there’s the bomber feature where a bomb will form a cluster of mystery symbols which can turn into the form of any symbol available in the game, except scatter. This is a game that will be enjoyed not only by Motorhead fans, but also by casual people that have no clue at all about rock music in general. Make sure to try it out and have fun with it!